The season has brought out the best in many. A rough summer in the Telluride area for climbers—rain has made life, well, we have not climbed that much in the past two months. But a few people were out there getting-in what they could regardless. 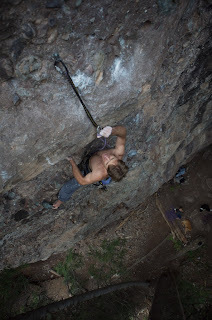 Todd Rector and friend Lance Waring (and others) established a note worthy addition to the routes in Upper Bear Creek: Gesus! 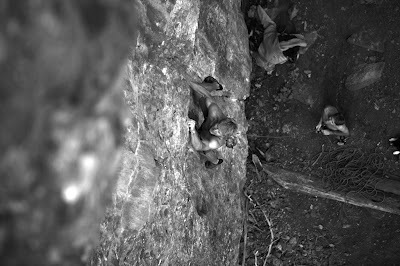 5.13a/b. (Photo: Lance Waring heading up to the pumpy overhanging crux moves just five body lengths away—making this the first clean ascent of Gesus!). The Sesame Street area has but few routes. You guest it, Bert & Ernie (two very fun warm-up 5.10’s). Most notable, Big Bird a classic 5.12d that will keep your attention the whole time your on it—and if your on to long, the Bird will take off leaving you in the air, with only the chalk on your hands and the sweat dripping from you brow to show for you extensive efforts. 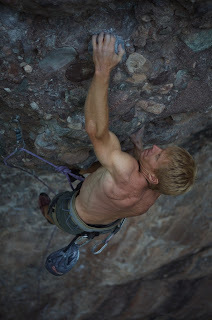 This area has a total of 8 established routes from 5.8 to 5.13a/b. The quality of which will keep me coming back time and again! Photos: Todd and Lance making hard efforts on Gesus!